Finally settled on a design for the journal I am making my friend Miri. It’s based on the Icelandic horse (Miri has one of these chunky Nordic horses, herself, and loves to ride) and her favorite color. 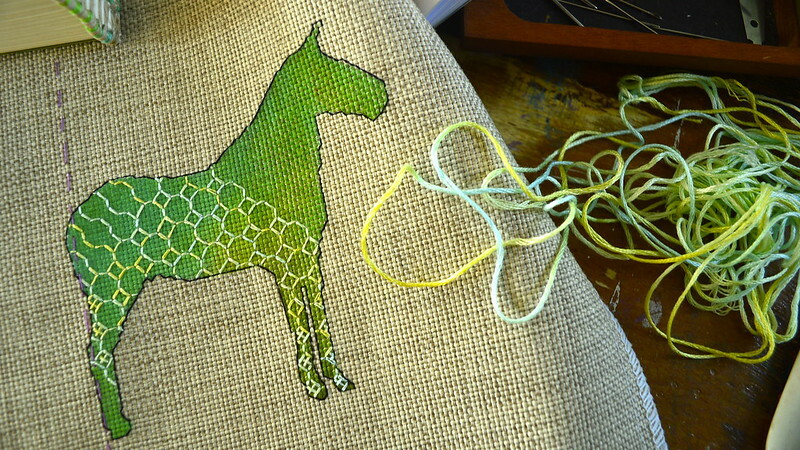 In keeping with the Nordic theme, the horse is a simple, solid silhouette of greens, overstitched in a counted-thread geometric pattern, worked on a rough linen-like fabric…I just love this stuff! Crazily, this is synthetic upholstery fabric, left over from a curtain job I did nearly a year ago. I took a closer look at it and saw that it’s an even-weave fabric (about 18-ct., which I love to work with, as it makes for fine stitching); sure wish I had more of it! It’s lined with a dense cotton on the back, making it thick and very stable to stitch. I love serendipitous craft discoveries like this. 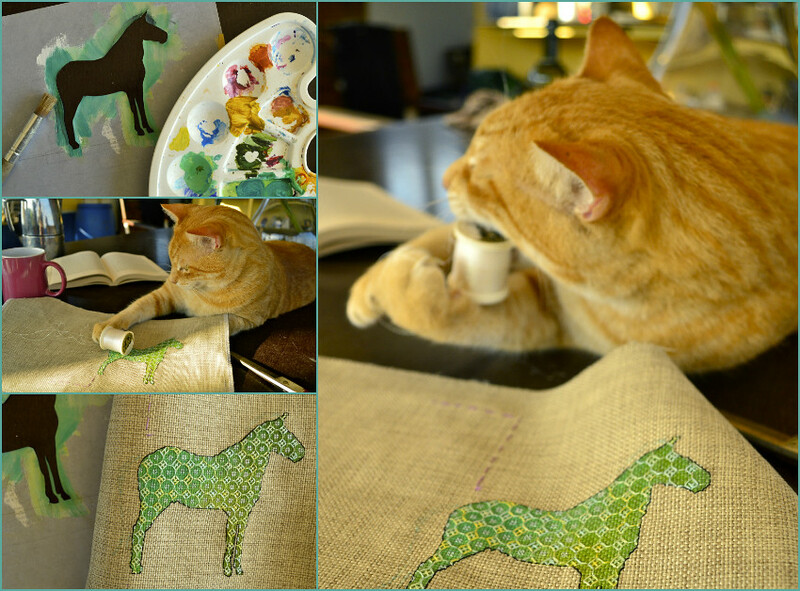 First, I cut a paper stencil of the horse and attached it to the fabric with re-positionable spray adhesive. Then I brushed undiluted acrylic paints on with a stencil brush. I outlined the shape in dark brown embroidery floss, using backstitch. Now I’ve filled in the horse shape using two strands of DMC floss and an allover blackwork pattern, with little cross-stitched squares in iridescent thread. 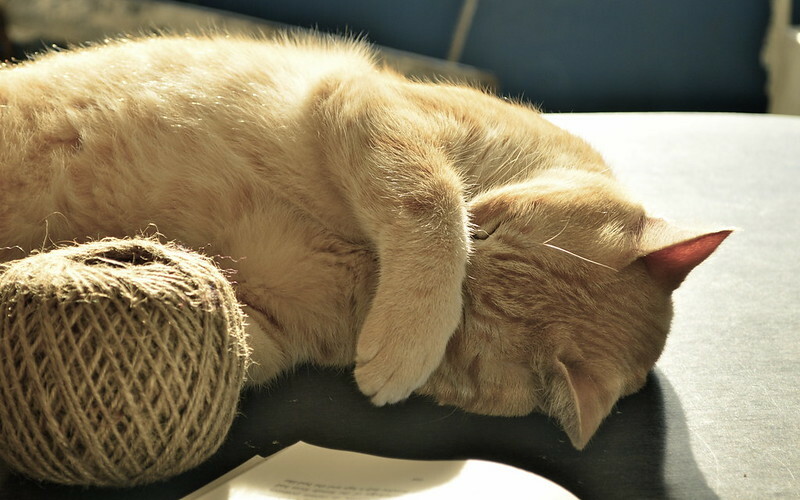 I tried to farm some of the work out to cheap labor, but that didn’t work out—he kept trying to eat the thread spool. I hope to finish the book covering today. I’ll be adding a mane and tail in fine running stitch lines. Haven’t decided what to do on the spine or back of the book, yet, but I’ll be keeping it spare and simple…clean lines, trying to emulate Scandinavian fabric designs, and using a palette of only neutral colors from hereon. Miri’s last journal, which I also made, is nearly full, she tells me—she needs her new tagebuch, stat! Hope she likes this new one; it’s very different from “Postcards from The Archipelago”. So back to work, despite the disgruntled worker’s labor strike and disruptive tactics. Serendiptous discoveries are always the most fun.. Fantastic, she’s a lucky friend!